What do we do with our suffering? All the enduring spiritual traditions of the world acknowledge that suffering is an inevitable part of human life. No matter what we do, no matter how we live our lives, suffering cannot be escaped. Certainly, not everyone shares in suffering equally. Some people must endure much more severe suffering than others. Yet, we don’t usually get very far by trying to compare our suffering to someone else’s. Our suffering is our suffering, and we must decide how to use it in our lives. For Christians, the crucifixion of Jesus is the symbol of suffering par excellence. The intersection of the cross of Christ is the intersection of suffering and injustice, as Jesus became the victim NOT of the Jewish people but of the Roman Empire, who responded to any challenge to its imperial authority with violence that was swift and sure. But the crucifixion is more than a symbol of suffering and injustice: it also becomes for us a gateway into understanding how we are invited by God to respond to suffering. For the cross of Christ opens on to the mystery of the resurrection. Out of the cross arises a life that is new, that is transformed, that is deeper and so enduring that we can call it eternal. Whatever else the mysteries of the cross and resurrection may be, they show us a God who in Christ embraces suffering and by doing so brings forth this new and deeper life. And so the cross and the resurrection invite us to do the same. When we encounter suffering in our lives, we have basically two choices: we can either embrace our suffering and use it skillfully to go deeper into our lives or we can hide from it in some way, harden ourselves against it and thereby fail to find its transformative power. Most of us, most of the time, make the second choice. We regard suffering as unfair, as essentially alien to the life we think we are supposed to have, and so we refuse to take it into ourselves. The last place we want to be is on the cross, because to be there confronts us with our own mortality; it confronts us with the impermanence of so much that we value; it threatens our ego. And so we do everything we can to avoid it. 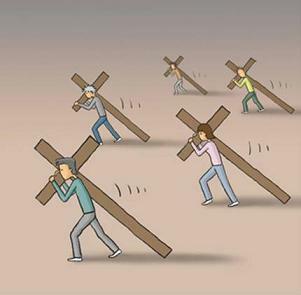 If, however, we accepted the invitation of Jesus to take up our crosses and follow the pattern that we see in his death and resurrection, we would handle our suffering in a much more skillful way, spiritually speaking. Rather than regarding suffering as an alien intruder into the idyllic life we think we are supposed to have, we would acknowledge that suffering is a fact of our lives and we would begin to explore its landscape in order to discover what it has to teach us. If we allow ourselves to move beyond the instinct for self-protection and beyond the desire to run from the cross, we will discover that suffering has the potential to lead us deeper into ourselves, to lead us beyond the false self to which the ego clings and into our true selves, where God is constantly present and which no kind of suffering can ultimately take away from us. We will have learned something of what Jesus means when he says that those who lose their lives will find their lives. I am convinced that the failure to deal with suffering in a spiritually skillful way is responsible for the perpetuation of suffering for ourselves and others. When we do not use our suffering to go deeper, then we often find ourselves overtaken by depression, anger, fear, anxiety. And having been overtaken by those negative emotions, some among us are motivated to lash out at others with violent speech and violent action. This results in more suffering which, if not handled skillfully, leads to more negative emotion and negative action, which in turn leads to more suffering and on and on. Reflection on all of this helps me to realize that Jesus’ teaching to take up our crosses and follow him into new life is a very basic, practical teaching for our lives. He knows that our lives include crosses – every human life does. We can pretend they’re not there, or devote ourselves to wondering why they are there, in which case they begin to crowd us. Or we can seize them and try to throw them out of our lives – in which case they can destroy our surroundings and injure others. Or, we can embrace them, as Jesus did, and use their energy to find a new, deeper, resurrected life. All of this is much harder to do than to say. But the truth is that the spiritual path is like anything else in life: if it is to be truly fruitful, it will require some work. So You Don’t Believe in God….. I came across this piece by Gordon Atkinson a while ago, and so I thought I would share it with you this week (with a nod to Greg Schaefer of the Lutheran/Episcopal Ministry at Stanford who found it and thus led me to find it). It’s funny, thought-provoking and kind to Episcopalians. I’m in the mood for something lighter this week! So you think you want to try Christianity, huh? You’ve been casting about for some system of belief for years. You have what we might call a spiritual itch, and you’d like to try and scratch it. Only there are a few problems. First, you aren’t sure if you believe in God. It’s an intellectual problem, really. You just aren’t sure if there IS a God. And if there is, you’re not sure you would trust the Bible to teach you anything about that God. Second, you don’t know anything about the practice of Christianity, and you don’t even know where to start. What church should you attend? Who should you listen to? What exactly would be required of you? How much would you need to do so you could honestly say you gave it a try? To start things off, you are now officially one of my favorite people. I don’t know why this is, and I don’t feel like unpacking it right now, but some of my favorite people don’t believe in God but are looking for something spiritual. Perhaps. Kind of open to the idea. Kind of in a maybe state about the whole God thing. Kind of sort of. I love people like that. And my experience is that they are often incredibly nice, kind, open to new ideas. Just cool people. I wish we could start things off for you with a big convention of misfit spiritual thinkers. That’s always been a fantasy of mine anyway. It would be mostly agnostics with some seriously troubled and doubting Christians thrown in the mix. We’d get rooms in a hotel somewhere and meet during the day to talk about God, the absence of God, the meaning of life, whether or not there IS a meaning of life. That kind of stuff. No one would think anyone else is going to hell. So we could all relax about that. At night we would drink beer, watch movies, and sit around laughing. We might play some pranks around the hotel. I’m not saying we would; I’m not saying we wouldn’t. But pranks would definitely be on the table and open for discussion. Yeah, that would be nice. It probably won’t happen though. A lot of people who would want to be there couldn’t afford to go or couldn’t get away. That would bum me out. Plus, I tend to come up with cool ideas, but I’m not so good with the follow-up detail work. I’m pretty lousy at that, actually. I haven’t even picked up my dirty clothes from yesterday. They’re behind the door in the bathroom. So what, I’m going to organize some huge convention thing now? Still, it’s a nice thought, right? So anyway, back to the whole “So you want to try Christianity” thing I was talking about. We won’t be able to kick this off with a convention, so you’ll probably need to find a church. Hoo boy, this is going to be hard. Um, don’t go to a Baptist church. I say this in love, as a Baptist myself, but the odds of you finding a bunch of Baptists who would be excited to hear about your agnostic, quasi-spiritual journey are about a thousand to one. My Episcopalian brothers and sisters would treat you right. Maybe. Some of them would. Okay, so I have two suggestions for you on this journey. Both of them are insanely unorthodox, from a Christian perspective. Don’t worry. I’ll handle all the objections and outrage from the brothers and sisters. And you don’t know any better, so you’ll be fine with these. First, it’s okay that you don’t believe in God. What can you do about that anyway, except be honest about it? Hell, I don’t believe in God myself sometimes. I come and go with that one. Sometimes life seems rather bleak, and I just can’t see it, you know? I want to. Just can’t. But mostly I believe in God now. Mostly. It’s okay. You’re really looking for a spiritual practice anyway. Whether or not you end up believing in God isn’t important right now. I’ve always thought that what you do with your life and your body is more important than what you say and think. You’re curious and open. That’s all you need, because anywhere you begin is a good place to be. Second – and this one is counter-intuitive – you should understand that prayer and worship and all that ritual stuff will be very important to you, since you’re not sure if you believe in God. You won’t have any nice, lovey-dovey God feelings to sustain you, so you’ll need to lean into what you have. Show up and do the singing and praying and liturgy stuff. Enjoy the archetypal beauty of it. Let go and be ancient for awhile. Go to church. Talk to “God.” Talk to people you meet. Be about the journey and be listening. You’ll be fine. And finally, this: If any church doesn’t treat you with complete respect and hospitality while you hang around there, trying things out and listening for any voice you might hear, send me an email. Send me an email…. And who knows? Maybe the two of us will get motivated to organize that agnostic/misfit-Christian convention thing. I’m thinking Chicago would be a nice place. While the origin of the English word “religion” is somewhat in dispute, one possibility traces the word through a Latin root which means “to connect”. It is the derivation favored by Richard Rohr in his recently published book, Falling Upward, and it speaks powerfully to me about the way I experience religion in my own life. Most essentially, my religion connects me in ways that provide meaning and create the possibility of transformation. These connections include a connection to my true self. As that connection is strengthened, I am able to live more authentically. 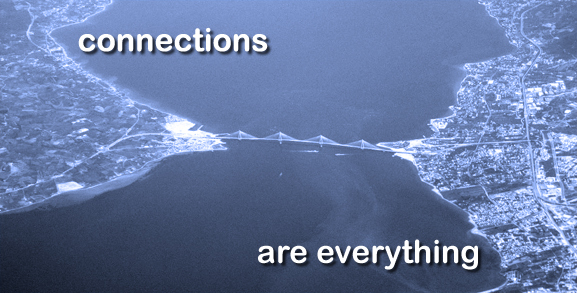 These connections include a connection to God, to other people, to creation. But these are not just any kind of connections: they are connections that are rooted in Christ, and it is the life and teaching of Christ which conditions all of these connections and makes them avenues of grace and possible transformation. The more these connections — these relationships with self, others and world — are shaped into the image of Christ, the less they serve my own ego and the more they serve God. That shape of Christ is the shape of compassion, justice, liberation, joy and love. To put it another way, religion as I experience it seeks to transform my dysfunctional connections (what might be called “dys-connections”) into authentic, life-giving and God-serving connections. Sadly, it seems obvious that many forms of religion serve not to repair dys-connections but to magnify, reinforce and enhance them. When religion is used to strengthen one’s ego, that is a dys-connection that empowers the false self rather than disempowering it in favor of the true self. When religion is used to condemn other people for who they are (be that gay or straight, black or white, rich or poor, male or female), that is a dys-connection — the creation of a distorted relationship with others. When religion is used to jettison the findings of science in favor of a doctrinal position, that is evidence of a dys-connection between religion and the world as it is found to be. It seems to me that the dominant forms of religion in American life today are full of dys-connections. Rather than connecting people to a deeper wisdom that enables them to live in the world more skillfully, rather than making people more spacious in heart and soul so that they may embrace themselves, others and the world with greater compassion, these forms of religion seem to lead people in quite the opposite direction: a shallow wisdom that, in the end, is no wisdom at all and a narrowing of heart and soul that seeks only to prop up increasingly self-righteous egos while devaluing and dehumanizing anyone who is a threat to those egos. The deep wisdom of all the world’s great religious tradition make clear that when we are overcoming dys-connections and making sacred connections, there is one very reliable sign of that process: we see the differences between ourselves and others less and less. And that means, of course, that we see the one-ness of humanity, dwelling in the unified field of the sacred, more and more. When we see religious people who are speaking and acting in ways that seek to divide humanity and make the distinctions between us more sharp, you can be sure that you are seeing people who do not practice their religion skillfully, and are caught in a web of dys-connections. Our response should not be to meet their dysfunction with more dysfunction. Rather, our response should be one of deep compassion, as we seek to become participants in their healing. Sometimes, we will be able to contribute to their healing by becoming closer to them. At other times, closeness may not be possible. In those instances, we can at least not make things worse and at best we can pray for their healing. This is exactly what Jesus taught, when he taught us to pray and do good for our enemies. The deep truth behind this teaching is, I think, Jesus’ understanding that such people are deeply dys-connected from authentic humanity rooted in God. He wanted his followers to become God’s instruments in healing those dys-connections so that they might discover the salvation that comes from a genuine sacred connection to reality. The last few months have witnessed a great deal of unrest in the Arab world, beginning with the uprising in Egypt that led to a change of government there and sweeping across a number of other Arab countries where, in some cases, protesters were met with brutal and repressive responses. This week, most of us were surprised, I think, to hear news of riots breaking out in London and then spreading to other cities in Britain. In one sense, the violence in England is not at all like the uprisings in the Arab world. Clearly, Britain is a modern democracy and not a repressive regime. While the Arab Spring has had a revolutionary dynamic, that is not the case among those rioting in Britain. In another sense, however, perhaps there is a connection. While some of those participating in the London riots have been described as hooligans and thugs who have just taken advantage of the situation, observers have suggested that at least a part of the violence is attributable to anger and frustration among the unemployed and underemployed and people who feel increasingly alienated from the mainstream of society. These are people who feel increasingly powerless and sense that government is less and less responsive to their needs and more and more at the service of the wealthy and powerful, whether those be individuals or corporations. We would like to think, of course, that such things will not happen in America, the land of freedom and opportunity. However, more and more people in our own society don’t find their freedom that much of a consolation as they spiral downward into poverty. And as they spend hours looking for jobs that are not there, America seems rather short on opportunity. Recently, I read that 2.3 million Americans are in prison – more than any other country in the world. Even more disturbing is the fact that about 30% of Americans are living in what might be described as functional poverty: that is, they don’t have income adequate to cover the costs of housing, food, transportation, child care, health care and the like (and they are NOT spending money on entertainment, Internet and “luxuries” like that). The official poverty rate is about 14%; but there are many people above the official poverty line who cannot make ends meet. That’s almost a third of the American people. And recent studies have shown us that the gap between the “haves” and the “have nots” in this country is growing. It was Dr. Martin Luther King, Jr., who said that “the arc of the moral universe is long but it tends toward justice.” Justice, indeed, is claimed by the Bible to be one of the primary concerns of God. In fact, there is far more about justice in the Bible than just about anything else. As followers of Jesus, we have an obligation to concern ourselves with the poor and the disadvantaged and to represent their interests before the powerful and wealthy in society. But if the exhortations of the Bible, the teaching of Jesus and the call of the Spirit are not enough for us, the uprisings in the Arab world and particularly those in Britain should remind us that those who are left behind by society, for whom there is no opportunity and only increasing hardship, will become more and more alienated from the rest of us. That alienation can erupt in violence and anger when people feel that no one is speaking for them or representing their interests and that they have nothing more to lose. St. Paul, in speaking about the church, uses the metaphor of the Body of Christ (1 Corinthians 12:12-26). He points out that everyone in the church is a part of that body, and that for the body to function properly every part needs to understand and feel its value. The same is true of any society. It works because all the parts feel and understand their value, have their needs met and are then able to work together for the good of the whole. We allow increasing numbers of people in our society to feel discounted, as if they were not a part of the body, at our own peril. Not to mention that to do so betrays the dream of God, the teaching of Jesus and what it means to be one of his disciples. The first sentence has become known as the Golden Rule, and it is a standard of behavior which members of Congress, perhaps even the President himself, and growing numbers of Americans seem to have utterly forsaken. The majority of our political leadership, and the majority of the voters who determine who those leaders are, seem to be growing increasingly fond of a very different rule: “do unto others?” What others? It is only I who matter. Those who follow this rule are so wrapped up in their own egos that they are unwilling – perhaps even unable – to see or hear any other point of view. Their only thought is of the rightness of their own cause, so completely enthralled are they by what they perceive as the brilliant light of their own intellect. They wish to be glorified, they wish to be honored, they wish for power and wealth. They do not see the plight of the poor. They do not care for those who have no job or who are underemployed. They have no time for those who have no access to healthcare. They do not wish to be confronted by those whose very being or way of life might challenge their own carefully cultivated perspectives of reality. They are interested only in implementing their own, private vision of “America” which they have convinced themselves will lead to nothing but sunshine and blue skies for evermore, as long as only the right kind of people are admitted to it. Yet the path of which Jesus speaks, the one that is wide, easily followed and leads to destruction is precisely the path that we find ourselves on when we fail to see and hear the needs and the suffering of others, including and even especially those others whom we find it most difficult to acknowledge. The wide path that leads to destruction is the path of the ego, which enthrones itself at the center of its own universe and delights in its own brilliance, glory and rightness. This path lacks compassion, it lacks understanding, it lacks the ability to see all the shades of gray that lie between the extremes. It is the easy road, the one that most of us follow. It is the path of the life that refuses to be examined and opened to transformation. The narrow path, however, the one that leads to life is the path that is shaped by the Golden Rule. It is paved with compassion, rooted in the understanding that everything that we do affects those around us – and the more power we have, the greater the affect our actions have on others. This narrow path does not ask, “What do I want?” first but instead asks, “What do you need?” It is a path that acknowledges the other, whoever that may be, and seeks to listen to the other, understand the other and honor the other as a basis for genuine conversation that has the potential to lead to conversion and thus to life. The deep dysfunction evident in our politics these days is an outward and visible sign of a much deeper and, to me, more alarming problem: a dysfunction that corrupts the very soul of America. It is easy to throw stones at our political leaders and to blame them for our problems – and they do, indeed, bear great responsibility. It is much harder, however, to stop our ranting long enough to examine ourselves, and ask how we fit into this chaotic equation. Washington has become dysfunctional because we, as a nation, have become dysfunctional. We are losing the capacity to listen to each other, to respect each other, to honor each other. We too often fail to acknowledge our common humanity and instead indulge in demonizing those who see things differently from ourselves. We insist on electing people as our leaders who have the most strident voices, who are least likely to be able to reach agreements with others. We receive our news only from outlets whose editorial policies reflect our point of view. The American people as a whole are choosing the wide path that leads to destruction and the actions and inactions of our political leadership reflect that collective choice. Deep in the heart of the Judeo-Christian tradition is a powerful lineage of speaking truth to power. The prophets were unflinching in their insistence on pointing to the corruption in their society. They spoke this truth not only to the most powerful but to the whole of the people of Israel. Jesus was unafraid to follow in this same tradition, seeking to hold the people of his time accountable for their choices and reminding them of the way in which those choices affected the most vulnerable among them. Those who seek to follow Jesus today should also not hesitate to speak the truth to our society on behalf of the most vulnerable, those who are most impacted by the decisions made in today’s political climate. It is not the place of religion to determine policy, but it is the place of religion to prick the consciences of those whose policy choices would lead to destruction.